New Jersey’s Criminal Code is specifically written to punish weapons offenses severely. One of the most common and most punitive charges is that for Unlawful Possession of a Gun. If you or someone in your family have been arrested and charged with unlawful possession of a weapon or unlawful possession of handgun, you’re facing the possibility of mandatory imprisonment. Under the Graves Act, defendants are required to serve mandatory state prison sentences with mandatory parole ineligibility periods for certain gun offenses. Anyone who has been arrested and charged with unlawful possession of a weapon, possession of a weapon for unlawful purpose, simple assault, aggravated assault, burglary, robbery or terroristic threats should contact an experienced Burlington County criminal defense lawyer. Prosecutors are tough on gun charges and if you hope to avoid a lengthy prison stint, you will need to use every resource possible to fight back. If you or your loved one was subject to a motor vehicle stop, had their car searched and were arrested for unlawful possession of a weapon or gun, the law firm Proetta & Oliver is available to assist. Our firm partners have dedicated their careers to criminal law and criminal defense work throughout New Jersey. Additionally, William C. Fay, IV, is a former New Jersey Deputy Attorney General. With experience prosecuting cases and defending them, Mr. Fay is well-equipped to handle your case. To contact our firm directly, please call 609-850-8284 today and speak with an attorney. Skilled representation from a criminal defense lawyer may be the only thing standing between you and prison. The primary statute that governs the offense of possession of an illegal handgun is NJSA 2C:39-5(b), which states, in relevant part: “(1) Any person who knowingly has in his possession any handgun, including any antique handgun, without first having obtained a permit to carry the same as provided in N.J.S.A. 2C:58-4, is guilty of a crime of the second degree. (2) If the handgun is in the nature of an air gun, spring gun or pistol or other weapon of a similar nature in which the propelling force is a spring, elastic band, carbon dioxide, compressed or other gas or vapor, air or compressed air, or is ignited by compressed air, and ejecting a bullet or missile smaller than three-eighths of an inch in diameter, with sufficient force to injure a person it is a crime of the third degree.” Basically, possessing any of the above listed items without a valid permit will result in either a second degree felony charge or a third degree felony charge. See further below for what penalties a second or third degree offense carry. 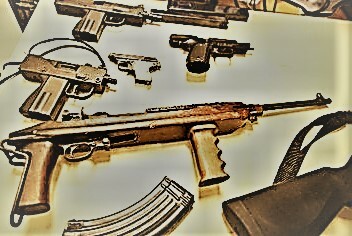 The primary statute that governs the offense of unlawful possession of a machine gun is NJSA 2C:39-5(a), which states, in relevant part: “Any person who knowingly has in his possession a machine gun or any instrument or device adaptable for use as a machine gun, without being licensed to do so as provided in N.J.S.2C:58-5, is guilty of a crime of the second degree.” Single-fire rifles can be altered to act as machine guns. Be sure to know exactly what you are possessing if handed a gun. The primary statute that governs the offense of unlawful possession of gun is NJSA 2C:39-5(c), which states, in relevant part: “Any person who knowingly has in his possession any rifle or shotgun without having first obtained a firearms purchaser identification card in accordance with the provisions of N.J.S.2C:58-3, is guilty of a crime of the third degree.” Again, the crucial part of this law involves whether or not the defendant had a valid firearms purchaser identification card. The primary statute that governs the offense of unlawful possession of a machine gun is NJSA 2C:39-5(d), which states, in relevant part: “Any person who knowingly has in his possession any other weapon under circumstances not manifestly appropriate for such lawful uses as it may have is guilty of a crime of the fourth degree.” “Other weapons” can referred to virtually any household or commonly used item. What turns a harmless item into an illegal weapon depends entirely upon the circumstances under which the defendant was using the item. These cases can be difficult for the Prosecutor to prove and we suggest that you speak with an attorney if you have been charged with N.J.S.A. 2C:39-5(d). What are the Penalties for Possession of a Weapon in Burlington Township NJ? Unlawful possession of a handgun or machine gun is a second degree felony offense that carries Graves Act implications. Graves Act, as discussed above, is a legislative mandate that requires that you be sentenced to a minimum of five (5) years in State Prison with forty-two (42) month period of parole ineligibility. But that is just the minimum, As a second degree offense, you are facing up to 10 years in prison. Unlawful possession of a shotgun or rifle is a third degree indictable offense that also triggers Graves Act implications. Typically, a third degree offense carries a presumption against incarceration. However, the Graves Act trumps this presumption and mandates that the defendant serve a minimum of forty-two (42) months of parole ineligible incarceration. Unlawful possession of a weapon (non-gun) is a fourth degree offense in New Jersey. As a fourth degree offense, you face up to eighteen (18) months incarceration and a $10,000 fine, if convicted. While the Graves Act attaches to most weapons charges, that does not mean that you are without hope of avoiding prison. Experienced attorneys can assess the strengths of your case and file a motion for a Graves Act Waiver, when appropriate. If granted, this waiver allows you to avoid mandatory jail time, or in the alternative, reduce your period of parole ineligibility. For more information on Graves Act Waivers, call (609) 850-8284. Needless to say, if you have been charged with unlawful possession of a weapon in Burlington County town like Willingboro, Cinnaminson, Mount Holly, Pemberton, Mansfield, Evesham, Mount Laurel or anywhere else, call the gun lawyers at Proetta & Oliver. Our firm is available for consultation 24/7 and can be reached by calling (609) 850-8284. Please do not hesitate to contact our office today for a free consultation with an experienced attorney about the particulars of your case.